In Anchor System Thinking, Shoukry presents a practical meta-thinking system for improving one's self-reflection and analytical abilities. In this book, Shoukry at least partly follows the behaviorist tradition of Ivan Pavlov, and therefrom derives a meta-thinking system he calls "Anchor System Thinking", which both builds upon and expands the behaviorist conception of the mind as a "black box". 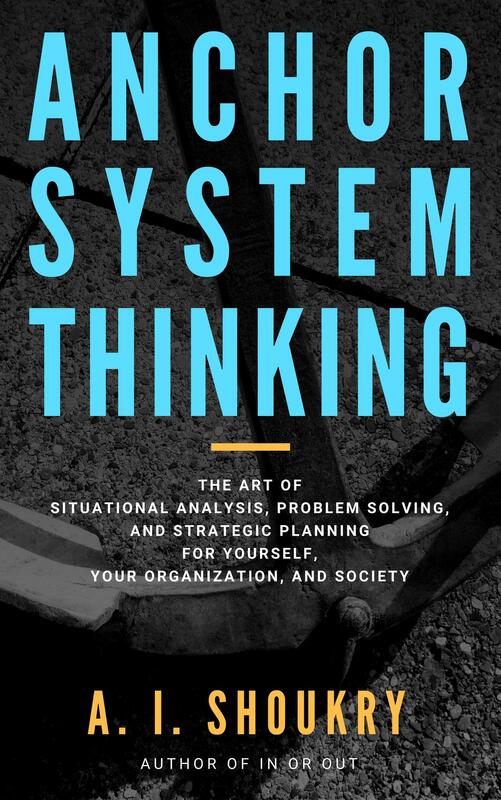 As such a meta-thinking system ought to be judged by its usefulness, I was naturally skeptical at first as to how Anchor System Thinking could improve one's thinking in "Situational Analysis, Problem Solving, and Strategic Planning for Yourself, Your Organization, and Society", as his subtitle proclaims. When I got further into the book, however, I started recognizing the value of the metaphor of the “anchor system” and the different components thereof. As Jocko Willinck has especially emphasized, it can be difficult for us to make an objective assessment of ourselves and our own situations, but I think Shoukry’s “Anchor System Thinking” could help one do that, if one understands and applies it adequately. The book is rather short, at just under a hundred pages, but with Shoukry’s curiosity and eloquence reflected throughout the work, in addition to his insightful examples and even interactive tasks for the readers to get more emerged with the meta-thinking system, it turns out to be both an easy, educational, and entertaining read. Additionally, Shoukry provides a good overview in the introduction to inform the reader about what he will explain in the individual chapters, highlights certain sentences he wants to emphasize, and last, but not least, he is doing a great job at categorizing the concepts he’s presenting, as well as the interaction between the categories, to illustrate how the metaphor can be applied to one’s own self-improvement. Among these categorizations, one that stood out to me was “entity anchors”, which was categorized into “objective”, “subjective” and “inter-subjective” entities. When I read this, I recalled that Yuval Harari had made a similar distinction in his best-seller book “Sapiens”, indicating that one inspiration of Shoukry's may have been Harari, though it’s possible that the idea was discovered separately. Nonetheless, Sapiens certainly works as a good complementary read to “Anchor System Thinking”, if one wants to delve further into the implications of that categorization. All in all, I enjoyed the book, and thought Shoukry had an interesting thesis of a meta-thinking system that could be useful to improve one’s thinking in analyzing oneself and others, and to further grasp how we’re all connected to things of which can have a smaller or bigger impact on us, like places, people and entities. If you’re interested in such meta-thinking systems, and/or want to improve your thinking to become a more perceptive analyst, I would recommend to check out “Anchor System Thinking” as a quick and easy read with a lot of good content. “I prepare all of my lectures and talks in my head while running,” said my friend, as he watched me put headphones in my ears, prepare my music playlist, and get ready for our run together. Running alone, with no music playing, on an empty beach positively reflected a sense of freedom. If someone was standing on the hill and watching me run, it might remind them of a horse running along the shore, which is usually described as “free” and “wild.” But are we humans really free like those horses? Horses have foals, and mares worry about providing food and safety for them. But do mares and stallions worry about their foals when they are grown up? Do they think about their foals when they’re running in the wild? Do they worry about their children while they’re at work? Do they think about what their boss says as they’re running? Do they have a boss or an assistant? Of course, we can’t know the answers to these questions. But we do know that us humans, even if we are running naked in the desert, will think about many things that keep us agitated or entertained. Even if you try to clear your mind of thoughts, you’ll be thinking about the act of clearing your mind. It may only be a temporary clearance until you finish your run, a thought forgotten forever, or one soon replaced by other thoughts. While running one day, I noticed how I am anchored to many things surrounding me. Even when I try clear my head from work, I think about life, my family, or the books I want to write. I may enjoy the surrounding trees or clear desert—or watch out for reckless drivers while putting a thought to rest forever. Sometimes, I retrieve a memory of my home country Egypt and linger on it for a mile or two. Basically, there are three main processes going on in our brains: grasping new data, retrieving old data, and deleting old data. Now, what makes certain data more important than other data? In other words, why is some data retained and other data deleted and forgotten? Why do I retrieve parts of these data sets while running? For example, thinking about my wife and kids, but not remembering other relationships with the same warmth and love? Why do I think about writing a book in the future? Why did I provide an example of a horse running and not a dog? And why do I think about Egypt, not New Zealand? What I know is that I love my wife, my kids, my family, and my country. I am devoted to my work and my patients. I belong to my past, with all its memories, good and bad, and I aspire to be a better doctor and a writer. My thoughts and beliefs determine my decisions. But how can I describe all these relationships? Where do I stand in all of this? In an increasingly stressful world, the need to understand where we stand and where are we going is fundamental. Is there a map I can draw to know exactly where I stand? Is there a word, a formula, that can help me describe my position on the map and how to move forward? Suddenly, as I was running and musing on this, the word “anchored” lit up in my head. Yes, I am anchored to all the things that surround me. My thoughts, memories, beloved ones, and work are all my anchors. I am the boat, life is the sea, and the seabed is what the anchor holds on to. Wow, I thought, this is a fresh idea I never thought I would have while running. I guess my friend was right—run and listen to your mind.